Here is a very rare photo of Eric Clapton jamming with The Yardbirds at the Marquee Club in 1966. Eric had quit the band a year before, because he thought their new single, ‘For Your Love’ was too pop. At the time, he only wanted to play the blues, so joined John Mayall’s Bluesbreakers instead. 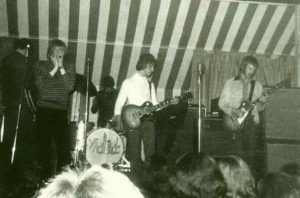 The Yardbirds replaced Eric with Jeff Beck, who had been with the Tridents before this. Eric regularly turned up to others band’s gigs at the Marquee and often jammed with them, notably the Spencer Davis Group, that featured his great friend, Steve Winwood. However, I have never heard of him playing with the Yardbirds after he quit the band, but this photo proves he did!